An outboard engine is a necessary evil on Aurora and I hate running it for any length of time, partly due to the vibration it causes in the cockpit. In addition to this, despite being made from a sturdy piece of Iroko, I know of two Cape Cutters where the outboard bracket has split along the grain. To this end, when I noticed my outboard bracket and it’s stainless mount needed some TLC at the end of last season, I decided to fabricate an improved one over the winter. 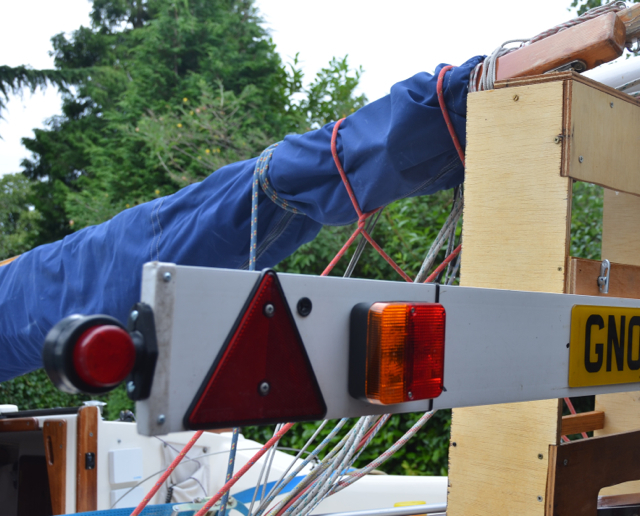 The concept was to make a laminated bracket and add bushes to give improved damping. Like many of my mods on Aurora, they are based on ideas I’ve seen in other boats, and this was no exception- Cape Cutter “Ladybird”, sports just such a bracket. I had access to some teak in the form of an old lab bench from work. This had a few millimetres planed off to give a good surface for bonding. Three oversize pieces were then clamped with crossing grain and glued with cascamite. Once cured, the laminate was cut to size and some holes countersunk to receive bushes on each side. I gave the bracket half a dozen coats of varnish and left it for a month to harden before clamping it in place on the stainless bracket (which had also needed a weld repairing). Henry Honda has also received some pre-season attention, in the form of some lubing and an oil change (mental note: perform lubing in autumn before winter storage). 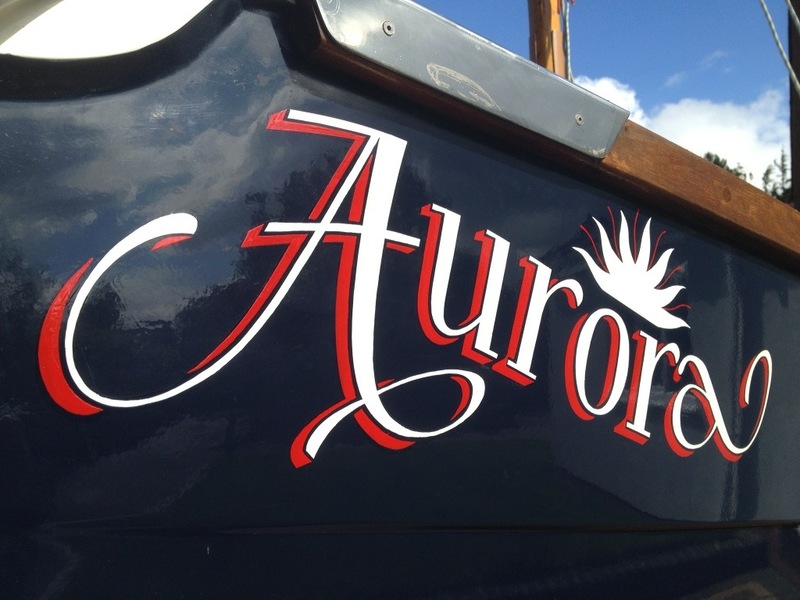 Aurora is at her home port of Stourbridge at the moment (I love writing that down when checking in to marinas! ), receiving a little TLC (i.e. varnish) before our next trip later this month. In our recent trip to the Essex coast, we passed the milestone of a thousand nautical miles of travelling in Aurora! This has been achieved in the slightly less than three years that we have owned her and I think an average of over 300nm miles per year is pretty respectable for a trailer sailer. I am really happy with how our little ship has performed. I put a lot of work into Aurora in the first two seasons we owned her, mostly in internal modifications. So how useful have these changes been? 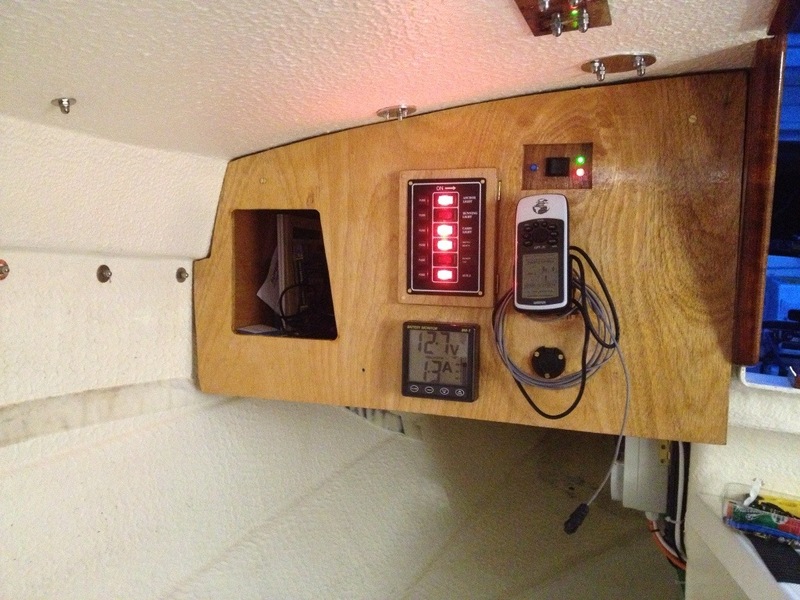 I added an internal instrument panel to hold the electrical wiring. I’m really glad I spent some time on this and, in fact I made a prototype panel before the current version, which is a bit neater and nicer looking. I find the battery monitor really useful, the handheld GPS mounted on its cradle, linked to a repeater in the cockpit is really useful (I can up- and down-load waypoints from the computer, so avoiding the pain of its c1995 interface). The brass hooks are really useful for storing keys, penknife, etc and are easily reached from the cockpit. 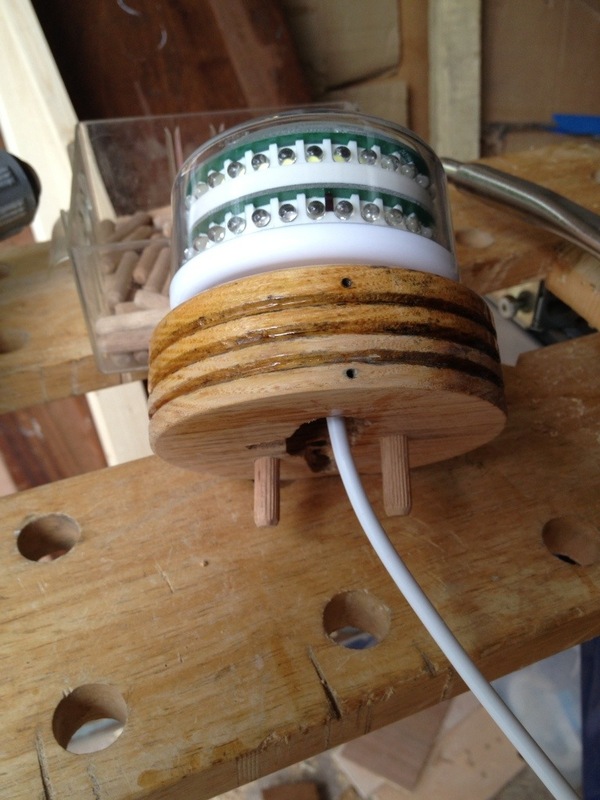 The LED interior light have been well-used, as have all three 12V sockets for charging up gizmos. The fixed VHF DSC radio (linked to the GPS) does not get used all the time, but is a big improvement on the disappointingly short range hand-held radio, and its reassuring to know that I can use it in case of need. The two 30W solar panels (with charge controller) have been a great addition, and mean that we are self-sufficient for power. Not fixing them to the deck means that I can move them around to get the best charging and stow them below when I need to (most of the time when we’re underway). The galley was pretty fiddly to fit (I got lots of help! ), but has been a massive asset. I did not want gas on the boat because I think the worktop is too close to the roof and because I find that space a bit too cramped. The meths stove we use is a little slower to heat than gas, but safer and convenient. 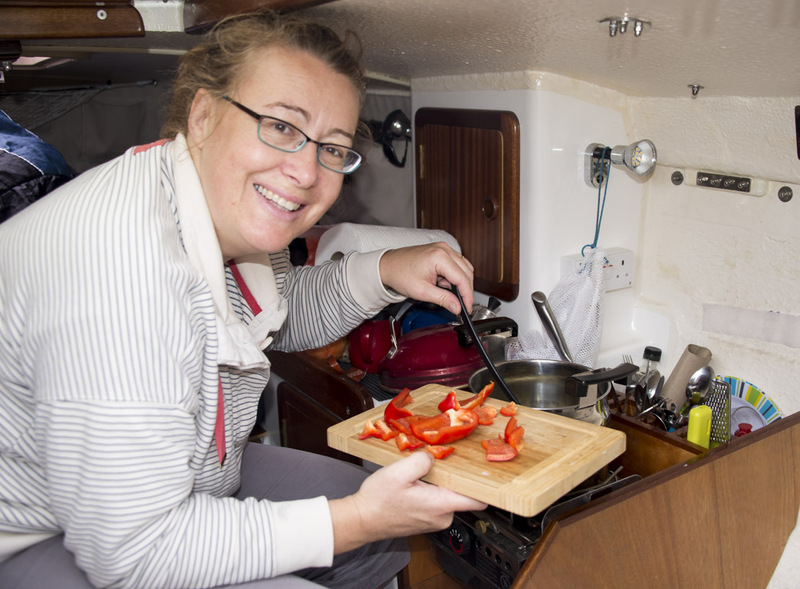 Having a proper gimballed stove means we can make hot drinks (or even cook) when underway, and the galley has convenient for tea and coffee making materials, as well as cutlery and crockery. To cope with wet weather, I had a simple boom cover made which attaches to hooks on the bottom of the strakes. This has (fortunately) not needed extensive use, but has been appreciated when needed. It means that we can get in and out of the boat in rain without getting the cabin wet, it gives us some more outside storage overnight and allows us to cook and sleep with the washboards out when its raining. The depth sounder is a pretty basic unit from Nasa marine, which combines a log. 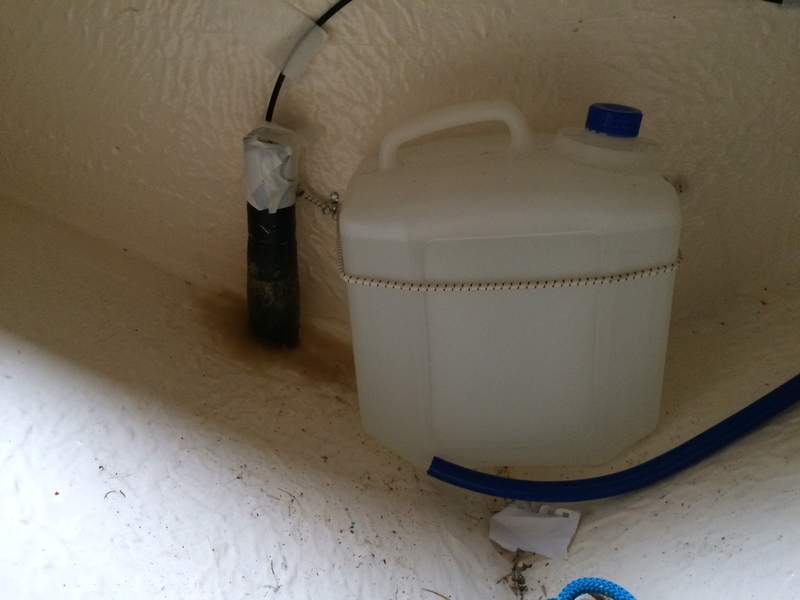 The depth transducer is mounted as far forward as I could manage (in the bow locker) and works well most of the time. It has its limitations, especially in shallow muddy water, where it has trouble telling mud from water (I have touched the bottom when it was telling me I had plenty of water on at least one occasion). Its better over a hard sea bed (rock or sand) and I think I have got better at interpreting what it is telling me. When I am creek crawling, I use my trusty bean pole instead, more often than not. 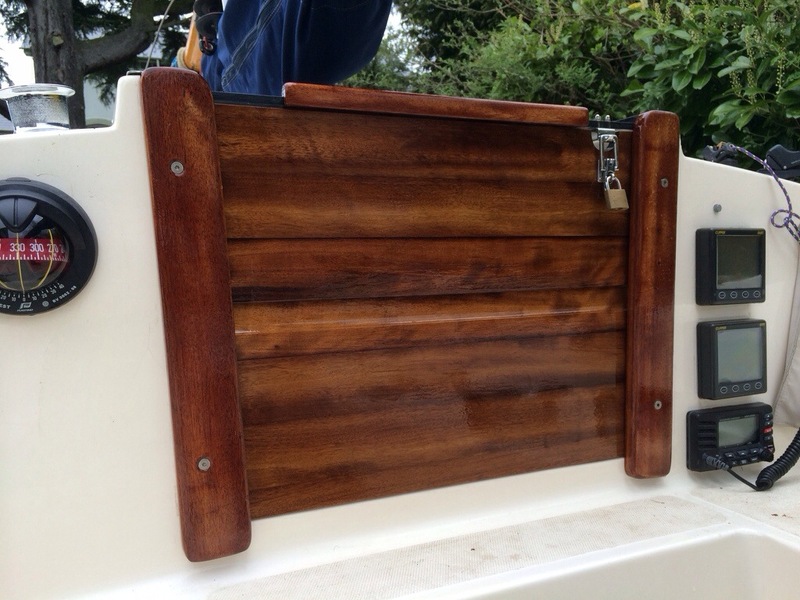 The through hull log which I fitted has been a great disappointment. It has rarely delivered a reliable reading and seems to need the paddle wheel changing very frequently. I’d like to have a measure of speed and distance independent of the GPS, not least so I can judge the strength of tidal flow, and I don’t think I would buy this same unit again. I chose it primarily on cost (very much the least expensive I found) and would probably go for one of the new systems which has a single, multi-use display which can be hooked up to a variety of sensors. 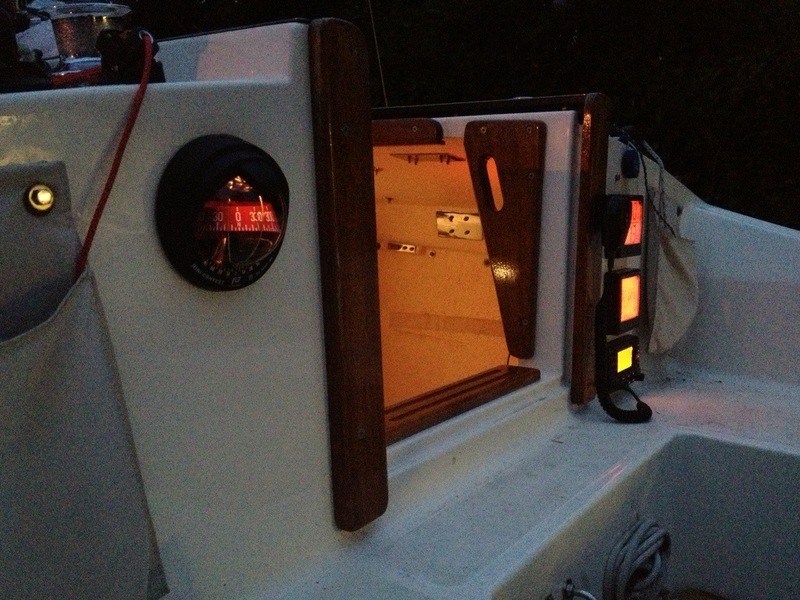 I spent a lot of time fitting nav lights to the mast head, and have rarely used them. I like the idea of occasional night passages, but somehow it just never happens. When I am anchored, I tend to use my dawn-sensor anchor light, which turns off when it gets light and saves the battery. The least used piece of equipment is the Yeoman plotter. This is a nifty device, but its quite big, so its a pain to store at night. Its great for longer passages, but most of the sailing we do is inshore, so it is less useful for the kind of sailing we do and thus tends not to get used. 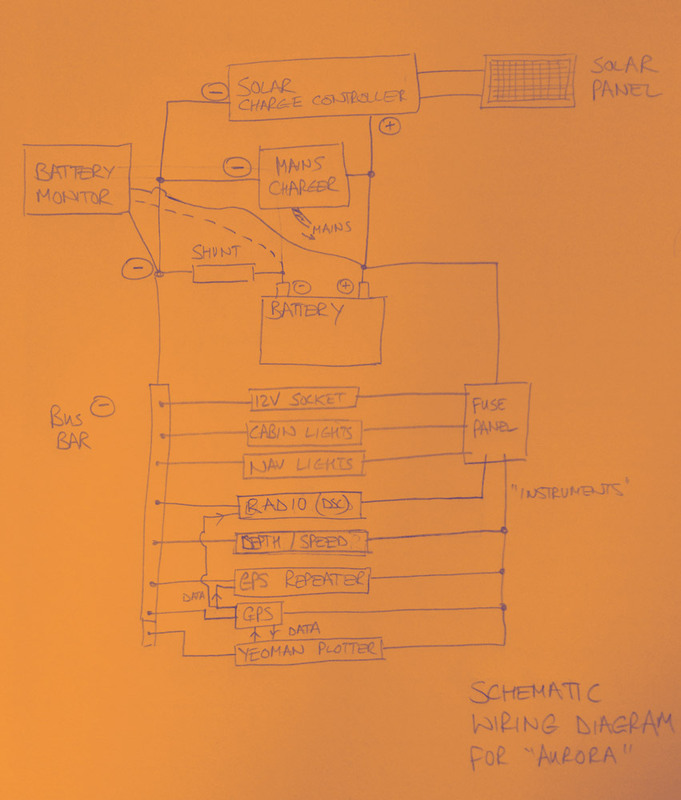 Here is a schematic for the wiring aboard Aurora. I’m no expert and I’ve worked this out for myself, but it might be of some interest. I would like to fit a tiller pilot at some stage, though this is not an urgent need, as I do not sail single handed very often. Drying out: I would like to make some kind of device so that Aurora can dry out on the level. I have some ideas, but don’t tend to dry that often, so that too does not seem very urgent. Circumstances have conspired to prevent me from getting Aurora on the water yet the season. However, I have been busy preparing her and making a few improvements for the new season. Our experience last season was that early sun tended to make the cabin too bright and wake us up early. To help with this, I had two-part hard wood washboards made. I have applied seemingly endless coats of varnish (free, thanks to the OGA Holyhead festival last year) and now they are fitted. There are a few other mods afoot; more details to follow…. Sorry for the awful pun, but a very significant upgrade for Aurora is almost complete. Having admired the galley which Russell designed and had made by a local joiner for Zephyr, his Cape Cutter 19, I wanted one for Aurora. It turned out that getting the joiner to make another galley unit was just the first step. So why does the Cape Cutter need a galley? This small boat is perfect for family trips, but without the means to prepare hot meals, its use is limited to being a day boat or hopping between marinas and eating out (which is mostly how we have used it so far). However we lack the ability to make a hot drink underway or easily cook a proper meal. We have used our much loved Trangia meths stove, but this cannot easily be used inside the boat and cooking in the cockpit is hard, especially when it’s windy. Others use a portable gas stove on the counter top; I don’t like this option, as the heat source seems uncomfortably close to the cabin ceiling and wall. Russell’s design provides not just cooking facility (gimballed stove), but puts all the bits and pieces (chopping board, knife, condiments, etc) to hand. The cost is to sacrifice part of the starboard wing berth and I definitely don’t want to lose the ability to sleep 2 adults and 2 kids aboard, but having seen Russell’s completed project was convinced that neither seat not the ability to sleep in this berth is lost (the sleeper has to wriggle a little further under the cockpit). It was also important to me that I could remove the galley easily if I wanted to. 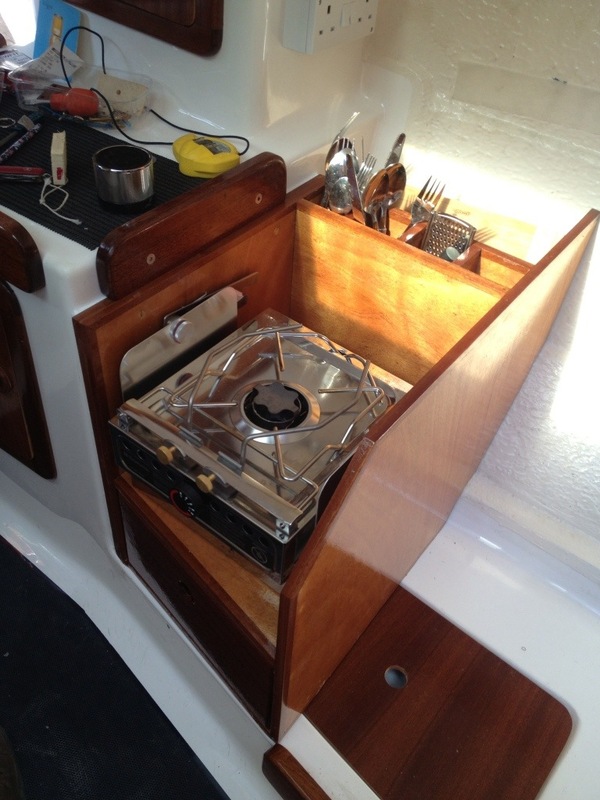 The galley unit, as provided by the joiner provides a space for a single ring burner (I chose an alcohol burner as I did not fancy gas on our small boat), as well as storage for cutlery and crockery, as well as a drawer for condiments. 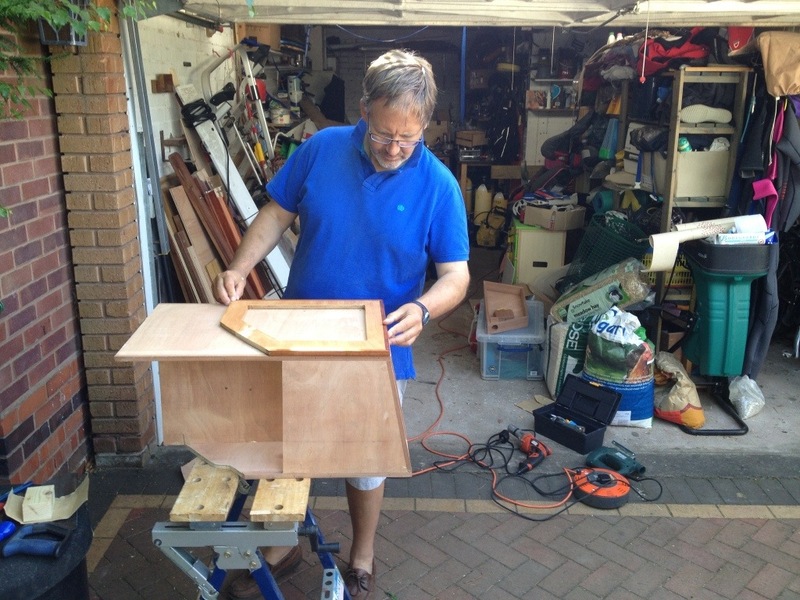 As my carpentry skills are rather limited, Russell kindly agreed to help me fit the galley and I am very grateful, as it took several hours of careful work to scribe it out until it was a good fit into the cabin (I stopped counting after the galley had been in and out of the cabin a dozen times). 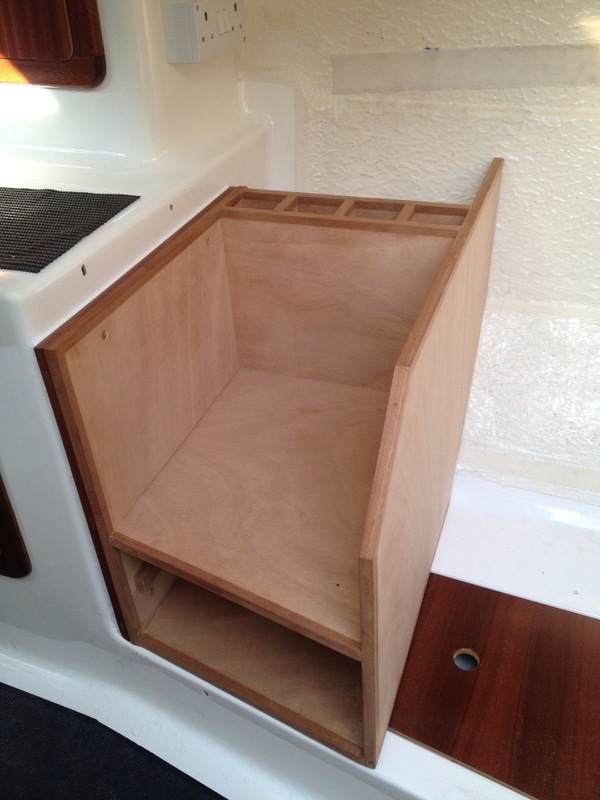 The side of the counter top to which the galley is attached is not flat, so a panel with a large hole in the middle to accommodate the bow is glued to the grp and then the galley is fixed to that. 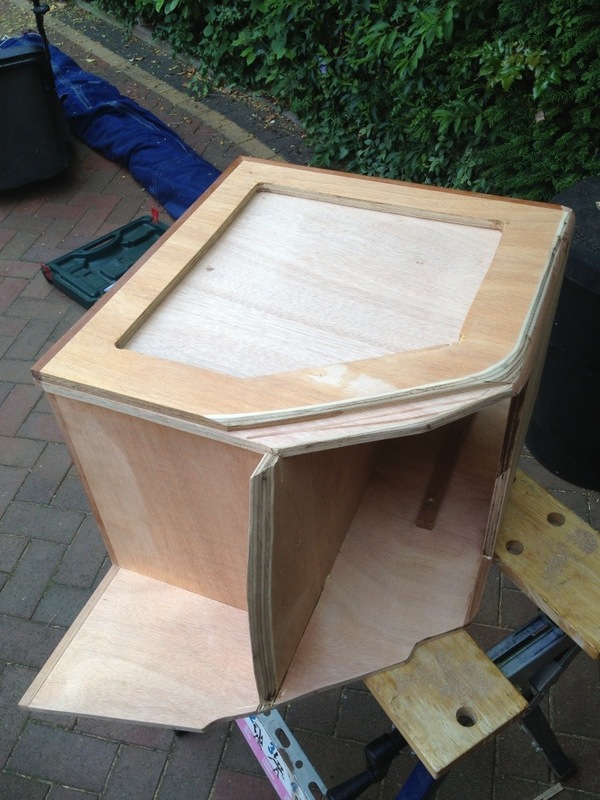 A further bolt will be added to secure the base of the galley to the base of the seat. Now the galley is fixed in position, I am waiting for the sikaflex to cure before unscrewing the galley and removing it for varnishing and fitting of the origo 1500 cooker. 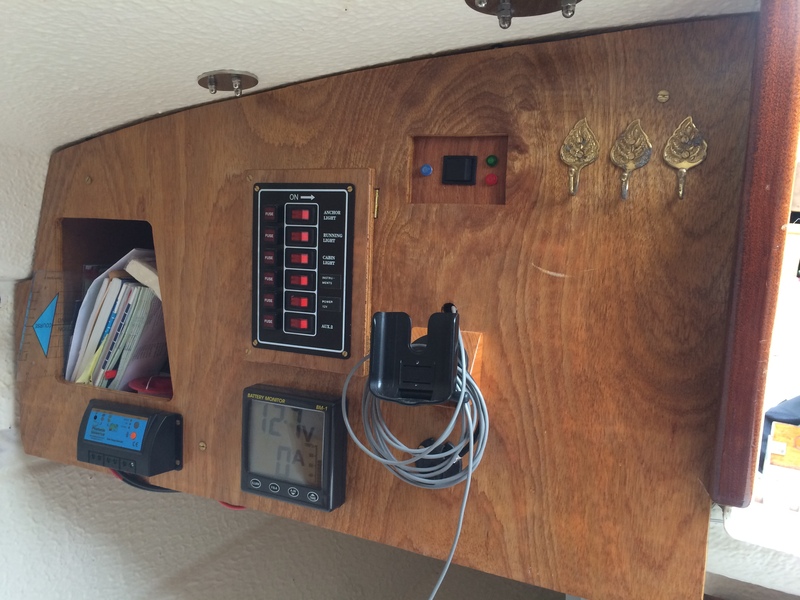 All got to be done in the next 5 days…..
After three coats of varnish and fitting the cooker, the galley looks great in position. The hardwood trim on the counter top needed a small amount a planing and the joiner made a shorter hardwood strip to replace the standard one that retains the seat cushion. All in all a really useful upgrade.